Val Kappa was voted "Class Clown" in high school, which was weird since she was always a bit on the shy side. During her freshman year at Emerson College in Boston, she took an acting class, where she wrote and performed a comedic piece she had written herself, called, "Uuna Goes Sledding". It earned her an "A", and some laughter. 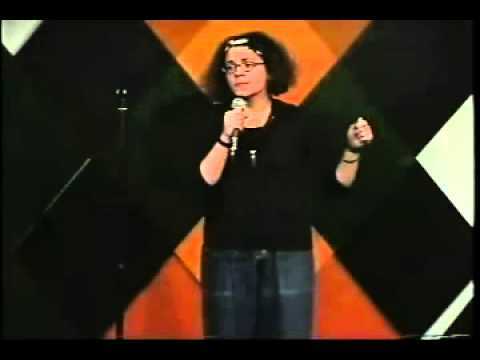 That summer she started to perform her Uuna character at comedy clubs and other venues in Boston. It was the perfect way for her to start out doing comedy. She got to see what it was like to perform at clubs, but under the safety of hiding behind a character. Part of the act consisted of Uuna trying to train herself for dealing with tough crowds. For this Uuna would ask the audience to heckle her, then she would throw a candy called "laffy taffy" at them in retaliation. After a year of buying large amounts of laffy taffy and wearing a snowsuit, Val decided to try something new…being herself. It was getting too hot to be wearing the snowsuit in the summer, anyway. So, she started to show up at clubs and campus functions reading shorts stories she had written. She did that for a year, then switched to doing straight stand-up. Since then Val has developed an act that draws from her life. Val graduated from college in May 2000, then moved to New York in 2001. Getting a majority of her stage time at alternative venues, Val found her comedic voice and was able to evolve her act into one that plays well just about anywhere. Val has performed at the Boston Comedy Festival and NY Underground Comedy Festival. She was also the voice of Clarice on the cartoon “Home Movies” that was on Cartoon Network’s Adult Swim. Recently she appeared on Comedy Central’s “Premium Blend”. These days she performs all over America at colleges, clubs and other venues.